44th President of the United States of America Barack Obama. I’m not going to get tired of hearing that any time soon. Once again I have no words to express the depth of emotion of this day. Darren and I watched the inauguration at home. We both had tears in our eyes more times than I can recall between the time Obama was introduced and when he left the stage after that most powerful of speeches. 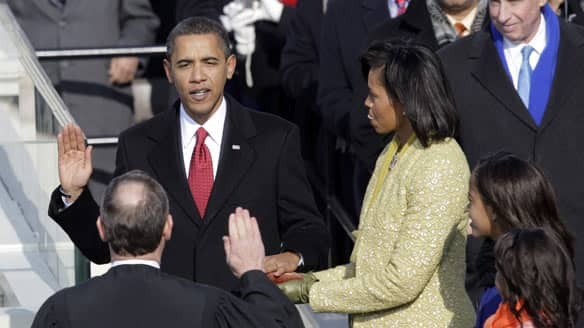 We laughed at the minor flubbing of the Presidential Oath (Roberts will get a mulligan in 2013 for Obama’s second term 😉 ) We were in awe of the size of the crowd – estimated, last I heard, at over 2 million. The whole tone of the crowd and the media covering the event was incredible. Someone on the inauguration team is brilliant: between the United States Navy Band “Sea Chanters” singing the National Anthem, Aretha Franklin to doing “My Country ‘Tis of Thee” and the John Williams’ arrangement of “Simple Gifts” for the Best Quartet Eveh! (Itzhak Perlman, Yo-Yo Ma , Gabriela Montero and Anthony McGill) we were pretty well served musically. Rick Warren’s controversial appearance was un-remarkable and since the Rev Lowery’s benediction blew that invocation out of the water, I can forgive them for inviting someone that devisive. I thought of my mother and my father and my younger brother while our new President was being sworn in. How much I wish they had lived to see this day. But I am proud to have witnessed this moment in history. I am so very proud of my country and so very hopeful that, despite the depth and breadth of the challenges we face, he can lead us back to the ideal of the United States of America that our fore bearers worked and fought and died for. BTW: Many thanks, Anita, for the invite to DC. Much as we would have loved to be there, I think we made the right decision. It sounds like it was a serious mad-house from start to finish – among other things, even people who had tickets apparently got turned away from the Mall or shut out of their ticketed section due to the over-crowding. Not to mention it was friggin’ cold. Watching it from the comfort of our living room on our own big-screen t.v. was quite alright by us. This entry was posted on Tuesday, January 20th, 2009 at 5:38 pm and is filed under Not adoption related, Politics. You can follow any responses to this entry through the RSS 2.0 feed. You can leave a response, or trackback from your own site.